The key concept introduced by HPX supporting and enabling the uniform syntax for local and remote operations is what we call a ‘Active Global Address Space’ (AGAS). In short, AGAS is a 128-bit virtual address space spanning all localities a distributed application is running on (a locality in the simplest case is a node in a cluster). Currently, this is a purely software based solution, thus the programmer has to decide what objects and what functions should be visible globally (should have a global address). Since the address space spans all localities, every global object’s address is unique system-wide. The figure below depicts the part of the system which is globally accessible in light gray and the objects which have a global address in dark blue. The parcel-port represents an abstraction of the communication channel used for inter-locality data transfer. In HPX, we call the messages sent in between localities – parcels. The uniform access is available on other systems as well (e.g. 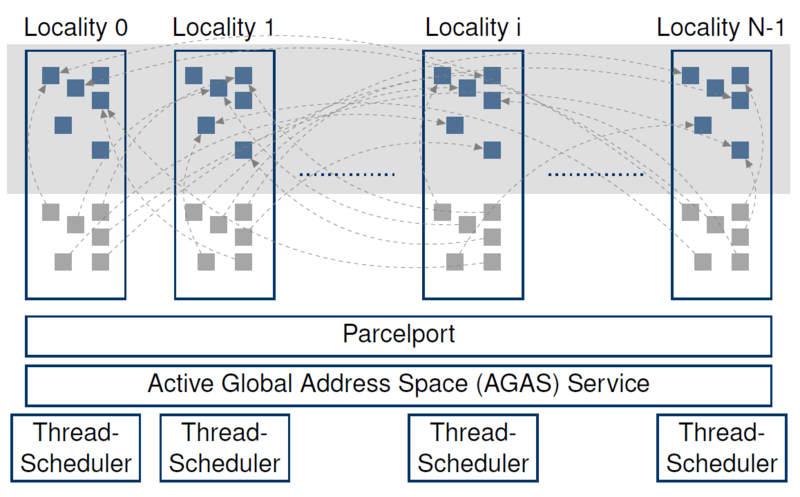 on those built on top of the Partitioned Global Address Space (PGAS)), but none of these systems support to move around arbitrary objects between localities. // function 'convert' remotely callable. The process of invoking a global function (or a member function of an object) with the help of the associated action is called ‘applying the action’. Actions can have arguments, which will be supplied while the action is applied. At the minimum, one parameter is required to apply any action – the global address of the locality the associated function should be invoked on (for global functions), or the global address of the targeted object instance (for member functions). The following table shows that HPX allows the user to apply actions with a syntax similar to what the C++ standard defines for ordinary, local functions. In fact, all action types have an overloaded function operator allowing to synchronously invoke the action. Further, HPX implements overloads of hpx::async allowing to asynchronously invoke an action, semantically similar to the wayhpx::asyncalready works for plain C++ functions (as described earlier). Additionally, HPX exposeshpx::applyfor fire & forget operation (amongst other API functions), all of which refine and extend the standard C++ facilities. c: the client object representing the remote object theactionis applied to. The future type returned from hpx::async is indistinguishable from any other future instance returned from other API functions. This warrants seamless integration of various asynchronous providers through a uniform interface. In this example, the function find_other_locality() finds the locality where to run the Fibonacci function on. It returns the global address identifying the target locality. We intentionally don’t show its implementation as this is outside the scope of this post. For each (possibly remote) operation, HPX resolves the global address identifying the target object using its implementation of AGAS. If the target of the operation is local to the invocation, a new HPX thread will be created on the current locality. This is very similar to what a purely local operation would do. If the target of the operation is remote, HPX sends the action through the parcel-port to the destination, where the encapsulated function will be scheduled as a new HPX thread. From the user’s perspective, in both cases the semantics are 100% equivalent. The only difference is the locality where the HPX thread executing the required function is scheduled. If all of this sounds interesting to you, please fork the HPX repository here and let us know what you think.